The most popular aventurine has a gorgeous, earthy green colour that varies in shade from a deep, almost black tone to a delicate pastel. This special gem is enhanced with properties that give it a charmingly glistening appearance. The name aventurine is derived from the Italian phrase "a ventura", meaning "by chance". This is an allusion to the unforeseen invention of synthetic aventurine glass (otherwise called goldstone) in the 17th century - Venetian glass workers dropped copper filings into molten glass which produced a wonderful sparkling effect. Thus, the mineral aventurine has a confusing origin to its name. This luxurious gem is distinguished by inclusions of minerals that form a shimmering effect called ‘aventurescence’. Aventurine is also often banded in appearance, and if the stone has an overabundance of fuchsite it is rendered opaque, in which case it is often mistaken for malachite at first glance. It is fuchsite (a type of mica containing chromium) which creates a medium to dark green colour with a silvery green or blue sheen in aventurine quartz, while hematite minerals give it a beautiful red brown to gold brown colour. In addition to dazzling the eye with its superb sparkle, beautiful aventurine is also believed to calm the emotions. This magical gem will certainly make for a stunning addition to any type of jewellery. 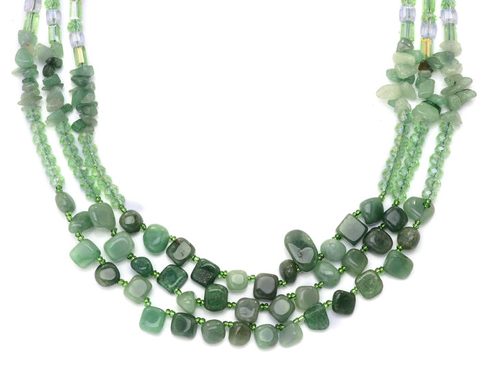 The ideal aventurine gem is semi translucent to opaque in lustre, with few inclusions and a stunning shimmering effect. Aventurine weighs 7 on the Mohs scale of hardness, so it is relatively robust in terms of handling wear and tear. Because it is a type of quartz rock, its physical properties can vary however. Since it is a fairly tough stone, aventurine lends well to any kind of cut, so jewellery designers enjoy giving it innovative styles and shapes. Aventurine can fade under sustained exposure to strong sunlight, so do take care. Aventurine is often mistaken for jade, amazonite and malachite, however these gems do not have its sparkly ‘aventurescent’ qualities. Chrysopase is another similar gemstone but is generally lighter in colour.